Powers/Abilities: Toxin's body secretes chemicals which range from deadly acids to powerful sedatives. 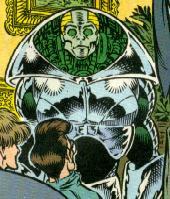 He requires a suit of armor built for him by Tantalus to retain his more human-like appearance. History: (Blackwulf#1)- Toxin was introduced to Dr. Caitlin Maddox, the newest ally of the Underground Legion. He dashingly kissed her hand. (Blackwulf#2)- Toxin learnt from Sparrow along with the rest of the Underground that Blackwulf was dead, killed by Tantalus. Sparrow was determined to have revenge, but Toxin knocked her out with a sedative for her own good. Toxin then joined the Underground in their mission to Wright-Patterson Air Force Base, to prevent the Peacekeepers from obtaining the corpses of two Skrulls held there. At the base, they met Lucian, who was now the new Blackwulf, and joined forces with them. The Peacekeepers escaped with one of the bodies, and the Underground were forced to flee from arriving soldiers in a stealth fighter, only to be shot down by the villain Scorch. (Blackwulf#3)- Toxin managed to save himself and Dr. Maddox by transforming the air around them into halon gas, but Wildwind was apparently killed. They fought Scorch to a standstill, but were forced to surrender when reinforcements arrived, and they were imprisoned at the base. (Blackwulf#4)- Toxin and the rest of the Underground were set free by Dr. Maddox and the Prime Skrull, and departed the base after Blackwulf brought them Wildwind's body. (Blackwulf#5)- Toxin joined the Underground and Giant-Man in journeying to Ottsville, Pennsylvania, where they fought a town full of people converted by Ultron's living circuitry. Ultimately, the people were made to think they had their free will back thanks to Giant-Man. (Blackwulf#6)- Toxin returned to the mansion with the Underground, and found that Wildwind had recovered. (Blackwulf#7 (fb))- The Underground learnt that Tantalus had used earth's Stargate to venture back into outer space, and devised a plan to follow after them. (Blackwulf#7)- At Club Galaxy, a space travel fundraiser where an actual space shuttle was on display, Toxin used his chemical powers to drug the entire crowd by serving as bartender. The Underground launched the shuttle from the club, with Toxin using his powers to convert the shuttle's exhaust into harmless chemicals. Along their travels, the Underground encountered the Kree Starforce, who joined forces with them as they set after Tantalus on Armechadon. (Blackwulf#8)- Toxin joined with the Underground Legion, Starforce, and the Underground of Armechadon against Tantalus and his Peacekeepers on Armechadon. (Blackwulf#9)- Attempting to save Dr. Maddox from Tantalus, Toxin's armor was destroyed by him, and he reverted to his normal appearance. Toxin warned Dr. Maddox away from him, disgusted by his true form. (Blackwulf#10)- In the final battle against Tantalus, Toxin switched sides to that of the Peacekeepers, knowing that only Tantalus could construct a new suit of armor for him. Toxin battled his one-time allies in the Underground, and following the death of Tantalus, he returned to earth alongside the Peacekeepers and Khult. Comments: Created by Glenn Herdling, Angel Medina and Bill Anderson.